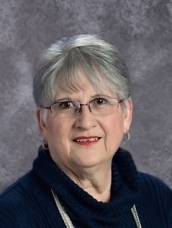 Mrs. Joyce Lund began her career in elementary education in the mission territories of Colorado. Now in her fifth decade of teaching, she finds a special joy in the freedom to incorporate her faith into her classroom. She has traveled extensively and is ever ready with the broad vision as well as specific details to make projects come together. Pope Francis' Jubilee Year of Mercy was a natural fit for her lifelong passion -- allowing OLV to shine in many arenas as the students brought the Good News of Jesus to the quiet, often-forgotten margins of Anchorage and its neighboring communities. Mrs. Lund is an accomplished theatrical director, musician and chorister who enjoys singing with Cantora Arctica. She and her husband Karl reside in Wasilla where they both devote much of their time, talent and treasure to our school.